So festive! And when I tell you they take about 20 minutes to make, I’m not kidding. Most of it is hands off time, too. 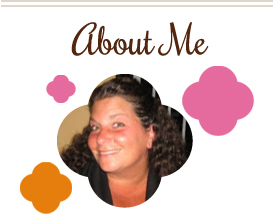 The kids will go crazy over them…and I bet the adults will as well! These can be made a few days ahead and kept on the counter, as long as they’re covered nice and tight. So, make them today and enjoy them on Sunday 🙂 Or, make them after Easter with your leftover Peeps! Preheat oven to 350 degrees. Line a 9×13 pan with foil and spray with cooking spray. Combine cake mix, eggs and oil. Spread evenly in pan (I used my hand since batter is pretty thick) and bake for 10 minutes. Meanwhile, chop up Peeps and set aside. 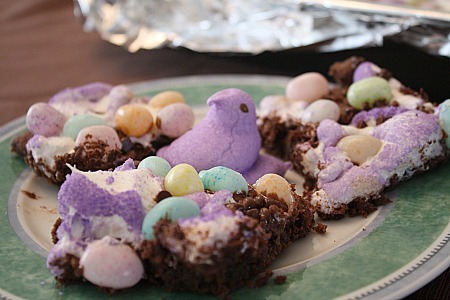 Remove cake from oven and add Peeps evenly over top. Bake for another 5 minutes. Remove and immediately add chips and jelly beans. Let cool completely before cutting. Use a warm/damp knife to make it easier to cut through the marshmallow. 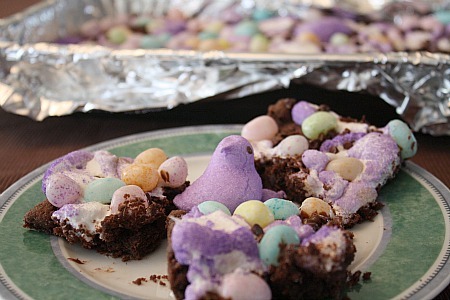 This entry was posted in cake, candy, chocolate, dessert, Easter, make ahead, marshmallows. Bookmark the permalink. I love Peeps! I’m sure my daughter would love these treats.